BLMIC- Three large baffles with six side ports and no top vents direct muzzle gases to the side, away from the shooter. 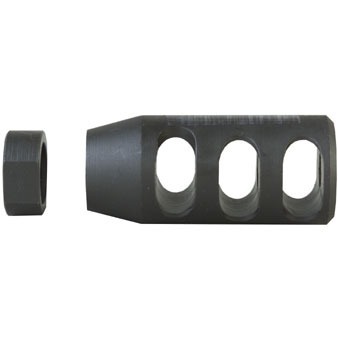 Effectively counters muzzle rise and recoil, minimizes felt muzzle blast. High volume shooters will appreciate reduced noise and ease of cleaning. Solid bottom minimizes dust printing when shooting prone. Easy installation, secured with the supplied lock-nut. SPECS: BLMIC- Steel, parkerized finish. 2" (5cm) long, .925" (23.5mm) diameter. ½"-28 tpi.